Virtually maximize your wardrobe with these clever closet, style and organization apps. Sometimes we need a little virtual assistance (how did we even live before Siri and Alexa?!) and that includes using closet, fashion and organization apps to streamline our style. Have you ever asked yourself: Where do I find that cute dress I saw an influencer wearing on Instagram? How do I keep track of my closet’s inventory? What do I pack for a trip to Paris? It’s raining, what should I wear today? Well, guess what - there’s an app for that! Check out some of my favorite apps below to take your wardrobe into the 21st century. Self described as the “Swiss Army Knife of style assistants,” this app is a clothing cataloging and organization life saver. Closet+ assists you in planning outfits based on a trip you’re taking or destination and provides useful checklists to ensure you pack all the pieces in your predetermined outfits. 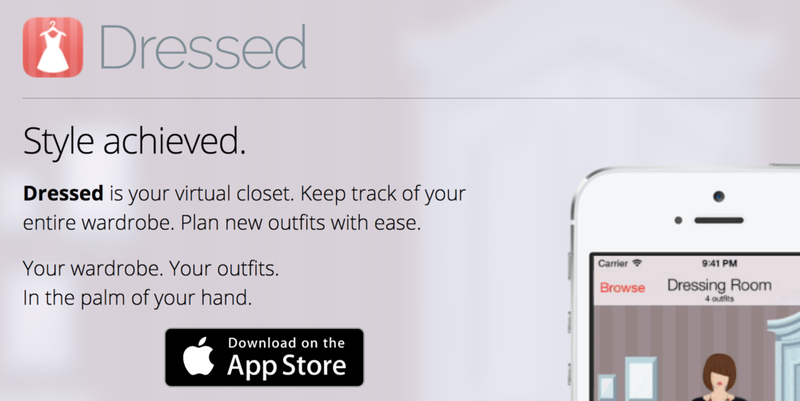 This app reminds me of a virtual version of Cher’s closet from Clueless. Maintain inventory of your clothing, shoes, and accessories, plan new outfits with ease, manage your pieces and even sort your prized possessions by brand, price, color, season, function, and custom tags to help you see exactly what you have. It’ll even remember the last time you’ve worn an item. Are you ever just dying to know where an influencer got an item she’s wearing in a post? This app lets you know where to find it. An Instagram shopping tool that helps influencer followers shop posts by emailing links to the item or similar ones from the look, this app is a shopping game changer! If you dress according to weather, this app is for you. Pose provides your city’s daily weather forecast while also giving you outfit inspiration based on the climate (or based on the type of occasion for which you are dressing). Plus, you can see what others are wearing on any given day based on the weather and your location. An on-demand personal shopping app (think of it as the black card of personal shopping), this app gives users access to an assigned fashion consultant 24/7. The company cultivates partners with stylists from an array of brands and stores including Chloe, Net-A-Porter, Stella McCartney, Derek Lam. One of my favorite features is that once you've found what you're looking for, you can shop directly through the app. This app assists you with cataloging and organizing any and all pieces in your closet -- from socks in a drawer to a handbag you want to resell to looks you want to pack for an upcoming trip. Because of the way Snupps is structures, the app is particularly handy if you and friends swap clothes regularly. Never lose a favorite (or pricey) item again! Shoppable content is where it’s at and this app has the process perfected. It started with the concept of allowing fans to buy what their favorite TV stars wore on screen (um, genius!). Today, it can be used to shop across shows, movies, YouTube and Instagram. This app does it all! A virtual closet for your real-life wardrobe, with over 90 tools, Stylebook allows you to do everything from keeping a running inventory of every item in your wardrobe to creating outfit ideas to analyzing the cost-per-wear of each item in your closet to help you shop smarter. Insider Tip: Get your guy on the men’s version of the app (Stylebook Men) to keep him organized, too! For a full service experience, this app is the best around. You can: see apparel items and looks on your own body, take your closet wherever you go (for in-store shopping and outfit creation), mix-and-match items from your digital closet with the latest items in-store to create amazing outfits, shop looks found on social media, and shop over 6,000 brands from top retailers. And, it’s free, so I’d say you get quite the bang for your buck!